Reading Heavy Historic Tomes in Three Languages So You Don’t Have To! 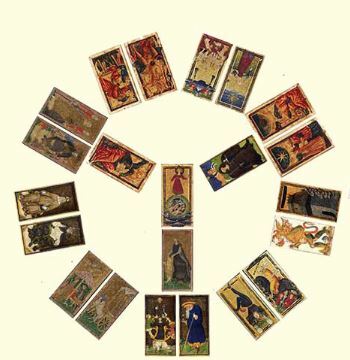 Tarot images are a collective dream of the European psyche. Immersing ourselves in the Northern Italian late Gothic environment where these figures first emerged will give us a deeper understanding of their archetypal message. Links will appear here as the articles are posted. When I created this section seven years ago, I intended to write a history of each trump card showing its development from the 15th century up to the present time. But someone else did the job for me. Years of procrastination paid off! I encourage you to hop over to TarotWheel.net and read the beautifully illustrated pages on each trump card. While you’re there, check out the History section. It nicely complements the History section of this website.